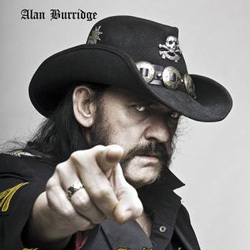 ‘Another Lemmy book?’ you’re probably thinking. Well, this one’s different for two reasons. Firstly, whereas the other recent offerings wheel out a selection of people who willingly profess their undoubted admiration for the Motörheadman, ‘Collateral Damage’ was written by someone with an almost forty-year friendship with Lemmy. Through then manager Doug Smith, Alan Burridge arranged to see and meet the band four times on the 1979 ‘Bomber’ tour with a view to launching a fanzine about them; he eventually took over and developed the Motörheadbangers Fan Club, and Lemmy counted him as a friend right up until then end. The other reason ‘Collateral Damage’ is different is because it’s not, strictly speaking, a Lemmy / Motörhead book at all: what Burridge set out to do as to research and log every appearance Lemmy made outside of the band he formed in 1975, and in that respect Lemmy’s – and Motörhead’s – life here is almost peripheral to Burridge’s catalogue of some 150 records/CDs and films. And as you can’t separate Burridge himself from the story, what you end up with is a book that’s one part catalogue of Lemmy’s extra-curricular activities, one part Lemmy biography and one part Burridge’s own role in the band’s backstory. But first and foremost it’s Burridge’s amazing catalogue that makes the book an essential part of any fan’s collection. From the obvious (Motörhead and Girlschool’s ‘St Valentines...’ collaboration; the band-breaking work with Wendy O. Williams) to the perhaps more obscure (Heidroosjes, a Dutch punk band, or Lemmy’s appearances in a number of weird ‘n’ wacky Troma movies) the book itemises them chronologically, and an amazing collection of cover art (and a clutch of band photos from across the years) adds to its appeal. To be honest though, it’s the relationship between Burridge and Lemmy that made the book so appealing to me, showing as it does that no matter how big the band became Lemmy never forgot nor took for granted Burridge’s support. A poignant touch is Lemmy’s hand-scribbled foreword which was written just before Motörhead took to the stage in Berlin on 11 December 2015 – no-one of course knew at that time that this was to be the band’s final gig – and the appendices, in which a couple of former colleagues recount their early recollections of Lemmy, are pretty much worth the price of the book alone.